¡ESTÉ SEGURO DE HACER CLIC EN LA ÚLTIMA FOTO (CUANDO DESPLAZAR A TRAVÉS DE FOTOS) PARA UN TOUR VIRTUAL DE LA ESCAPADA !!!!! Bienvenido a la escapada en Banner Elk! The Getaway está ubicado en el centro de Banner Elk, justo arriba de la calle del parque de la ciudad. Nuestra casa ofrece una cama king size en el dormitorio principal, junto con un baño completo con baño, tocador doble y vestidor. El dormitorio de invitados cuenta con una cama queen size y literas con dos camas individuales, un baño en suite con ducha. La cocina está totalmente equipada con encimera plana, acero inoxidable, estufa de 5 quemadores, horno, lavavajillas y nevera con máquina de hielo. La sala de estar ofrece un gran sofá con muchos asientos, un nuevo 40 pulgadas. televisión de pantalla plana con HD TV por cable. Lavadero completo con lavadora y secadora de carga frontal de tamaño completo. En el exterior encontrará una gran terraza con muchas tumbonas, mesa para comer al aire libre, fogón y excelentes vistas de la montaña de la haya. Nuestra casa se encuentra a una milla de la luz de la parada en el centro de la ciudad y se encuentra a poca distancia de todas las comodidades de la ciudad. Great house!! Very warm and welcoming. There was deer in the yard. The house was comfortable, clean, and spacious. Plenty of room for our two small kids 1 and 5 to run and play. Rented in winter and house stayed very warm (temp down to 0). Within a 5 min drive or less of shopping center and restaurants. Short commute to skiing. tubing, etc. Only drawback was steep drive with small turnaround at top. Was able to maneuver in Xterra but larger SUV would have been very difficult or require reversing drive. Yes, the driveway is steep and I point that out in the listing. Parking at the top is for one car and is tricky getting turned around. It is a tight fit! Especially in the winter months with snow on the ground. We really enjoyed the cabin! It was very accommodating and clean!! Great cabin and features, and it was very clean...one of the cleanest we've ever stayed at. With a 10-month old, it mattered what little guy might find on the floor, and there were zero issues. Beds were comfortable and the location was remote and super quiet; exactly what we needed. As previous posters mentioned, the driveway is steep, but hey it's the mountains and it was no problem for us. Drawbacks: The VRBO Home Away app!! The smartphone app triggered and appeared the day before arrival on our phone, which was nice, reminding us of our upcoming trip and all the details. Well, be sure to double-check those details, as they were misleading. Specifically, the app said that upon arrival, the lock-box code to get the house key was " " <--that's BLANK, btw. So I had to call the owner late at night to get the code, which I felt awful for. GAH!! Also, in the VRBO app said that the wifi was on a constand connection with no sign-on required. Well, that was the furthest from the truth. It wasn't until the next day we saw the info inside the cabin that there was indeed a password required. GAH!! Could have saved a day's worth of data from all of us. I have no idea of the connection with VRBO owners and the downloadable app, but there needs to be some due diligence there. This experience tells me that owners and the app are clearly not talking to each other as to what is reported out to guests, and this guest suffered by trusting the app's prompting. To be fair, I'm still not sure if an email had previously been sent out that said "DON"T TRUST THE APP, HERE'S THE CABIN INFO!" But with busy lives, and the app comes a'calling the day before, those two need to agree on the information being sent out. Other than those very minor issues, we could not be more pleased with the Getaway. Super, super cozy and you'll love it. We even enjoyed the fire pit out back. Plus, our son began to walk at the Getaway that weekend which we'll always look back on with fondness. Thank you so much for your kind words about the cabin. I try very hard to anticipate my guests needs. I do not use the VRBO app, as I personalize each guests information and email it directly. The code for the lockbox is changed for each guest and all the information about the cabin, Wifi password and such is in the Welcome Folder on the kitchen counter. Each guest gets a personalized email with information about the area and the cabin. My phone number is there for a reason. I was not bothered at all with a phone call about the keys. That is what I am here for. The guest. 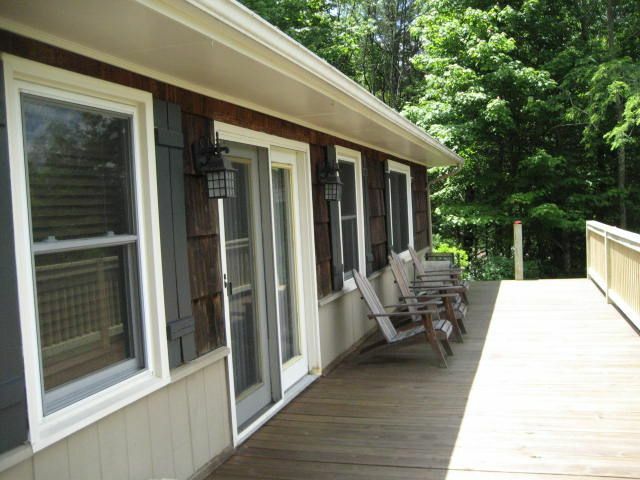 The location was so convenient to all that Banner Elk has to offer while offering a private and quiet retreat to rest. We're hoping to come back to this spot again soon. From the minute we walked in the door, we felt at home. The home was clean and very comfortable. The kitchen was well equipped. We loved that we could walk into town and that we were so close to golf courses, hiking trails and all the surrounding towns. Coming from Florida, we enjoyed the beautiful weather with temperatures of highs in the 70’s and lows in the 50’s. We couldn’t believe it was August and we were lighting the beautiful gas fireplace a few times. We highly recommend “The Getaway”. Thank you so much for your review! We love hearing that you enjoyed the month of August at the Getaway! En el invierno, la casa está a pocos minutos de esquí Haya o Sugar Mountain Resort. En el verano, se puede caminar hasta el parque de la ciudad, festivales y restaurantes. El golf es sólo un corto de 10 minutos en coche del campo de golf público de la montaña de azúcar. Ferrocarril Tweetsie, Grandfather Mountain, Blowing Rock, Linville Falls, Linville cavernas y otros lugares de interés se encuentran a 30 minutos en coche. Holiday Rates and a 3 night stay is required for: MLK Weekend Presidents Day Weekend October 7-9 October 14-16 Please feel free to call, email or text if you have any questions about my rates. I will be more than happy to hear from you!